Oct. 20 — The most important factor for U.S. Supreme Court nominees is ideology—not qualifications for the job, political science professors told Bloomberg BNA. That spells trouble for Chief Judge Merrick Garland of the U.S. Court of Appeals for the District of Columbia Circuit, who was briefly, if only implicitly, at the center of the final presidential debate Oct. 19. It’s been more than 200 days since President Barack Obama nominated Garland to fill the vacancy left by Justice Antonin Scalia. But GOP senators insist that the next president should make that selection, and have, therefore, refused to hold confirmation hearings for the veteran jurist. Politics has always played a role in the selection of federal judges, especially Supreme Court justices, Lee Epstein, of Washington University Law, St. Louis, told Bloomberg BNA. But ideology “plays a greater role now than ever before,” Epstein, who focuses on law and politics, said in an Oct. 2 e-mail. At the same time, a nominee’s qualifications to serve on the bench “are not as important a factor as they once were,” Jeffrey A. Segal, who teaches politics and the Supreme Court at Stony Brook University, Stony Brook, N.Y., told Bloomberg BNA. Nominees typically make it successfully through the Senate confirmation process. 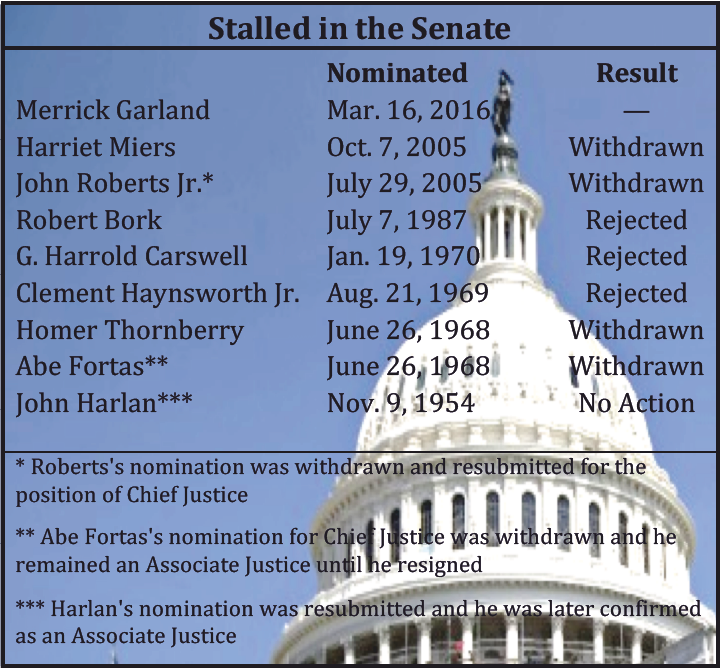 Prior to Garland’s nomination, only eight of the 34 nominees put forth since the 1950s have stalled in the Senate, according to the U.S. Senate’s webpage. While some of those nominees were eventually successful, the reasons behind the failed nominations vary. But politics and the nominee’s ideology have been increasingly creeping into the consideration of Supreme Court justices, Epstein said. “A near-universal consensus exists that the nomination of Robert Bork in 1987 triggered a new regime in the Senate’s voting over presidential nominees—a regime that deemphasizes ethics, competence, and integrity and stresses instead politics, philosophy, and ideology,” a 2006 article by Epstein, Segal and Chad Westerland, of the University of Arizona, Tuscon, Ariz., in The Journal of Politics said. Bork’s highly controversial nomination was opposed by liberal groups like the NAACP. The former Solicitor General and D.C. Circuit judge was ultimately rejected by the Senate 42-58. But the focus on politics “had its genesis some three decades earlier, in the late 1950s,” the article said. With “nearly each passing nomination after Harlan, the politics of the candidate vis-a-vis the senators exerted more and more influence on their votes,” it said. John Marshall Harlan II was nominated to the high court bench in 1954. After no action was taken on his nomination, it was resubmitted. He was eventually confirmed as an associate justice in 1955. Still, “Bork’s candidacy elevated the importance of politics to new heights,” the article concluded. Garland’s nomination confirms that politics and the nominee’s ideology remain the most important factors. That part doesn’t really hold true today, Segal said in an Oct. 17 e-mail. In the late 1980s and early 1990s, the “Senate unanimously confirmed the very conservative and highly qualified Antonin Scalia and only three senators opposed the very liberal and highly qualified Ruth Bader Ginsburg,” Segal said. “Yet 22 senators (all Democrats) opposed the conservative, highly qualified John Roberts and 42 senators (again, all Democrats) opposed Samuel Alito” in 2005, he said. Now, “Republicans will not even allow a committee hearing on Merrick Garland,” Segal said. Garland, who has 18 years of judicial experience, including as “Chief Judge of the most important federal appeals court in the nation,” is “more qualified to immediately serve on the Supreme Court” than anyone else, the White House’s website said. “Qualifications are best thought of as a necessary, but not sufficient, condition for confirmation,” Westerland, who focuses on judicial politics, told Bloomberg BNA in an Oct. 17 e-mail. “A nominee with poor qualifications has almost no shot of confirmation, regardless of ideological positioning, while a highly qualified nominee will be confirmed if the perceived ideological position is close enough to enough senators,” Westerland said. Therefore, the “perceived ideological distance between a nominee and a senator is still a critical factor, even for highly qualified nominees (such as Garland),” he said.